Still working on the next DVD cover, but in the meantime anyone who’s interested in graphic design and data may like my new book, Time & Space Visualiser, which is now available from Amazon. This is the first ever book to look at both the factual and fictional history of Doctor Who through data visualisations, presenting information about the show in a way never seen before. Using a range of eye-catching graphics, it reveals who are the most popular writers and directors, all the places on Earth the Doctor has visited, which companions gained the most experiences from their travels, the most common comeuppances for New Series enemies, how long it would take to watch every episode back to back, and much more. Each chart is accompanied by detailed notes discussing the background and context of the areas under examination, how the data was compiled and what it reveals. The book is 120 pages in full colour throughout, US Letter sized (22x28cm) with a softcover. You can see some sample pages by clicking here. 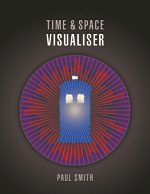 If you’re interested, Time & Space Visualiser: The Story and History of Doctor Who as Data Visualisations is available now from Amazon.co.uk, Amazon.com and other Amazon country sites.